So, I have been on my holiday break for a week now. I was clearly ready for it, as I spent most of the first three days sleeping. In fact, I spent the entire first week doing … nothing. It was bliss. I finally managed to drag myself outside yesterday. I took the bus out to the deserted campus in the afternoon where I picked up some clothes and let Chewy run around off her leash for an hour before coming home. Then last night I ventured out to discover that sometime over the past few days my neighborhood had been completely transformed. Preparations for Chinese New Year are in full swing and vendors have completely overrun the area, selling everything you can imagine. I ran back upstairs and grabbed the camera. There was color everywhere. 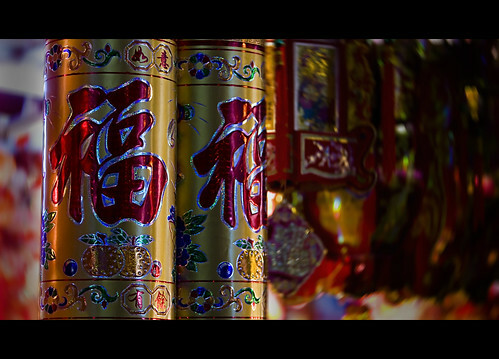 These large firecrackers are emblazoned with the character Fu – 福, meaning good luck, good fortune or happiness! I think maybe I just didn’t notice all this last year because frankly, it was so cold I wasn’t outside. This year the weather has been crazy good (68 yesterday) and lots of people were out enjoying the spring-like conditions. I was trying my best to be inconspicuous but it’s nearly impossible, even in a crowd. I had no one to run interference, so before long I had gathered an entourage and that makes composing photographs difficult. Still, I had a good time. One of the coolest stalls offered lacquered chop sticks, in every color imaginable. There is a big move afoot in China to encourage folks to stop using disposable wooden chop sticks. In China alone, an estimated 45 billion pairs of disposable chopsticks are used and thrown away annually. This adds up to 1.7 million cubic meters of timber or 25 million fully grown trees every year. I never really thought about it much but it’s true, that most everywhere I eat, the utensils are the cheap wooden sticks that are thrown out after use. Chinese lanterns are everywhere of course. This vendor offers plastic electric versions, with a rotating center. 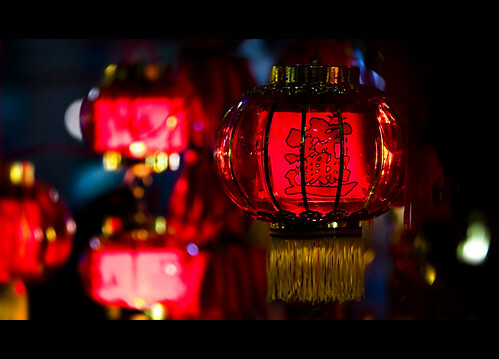 The characters here, zhāo cái jìn băo – 招财进宝, wish everyone riches and treasures! It’s a traditional expression of good will especially at New Year. 2009 is The Year Of The Ox (牛). 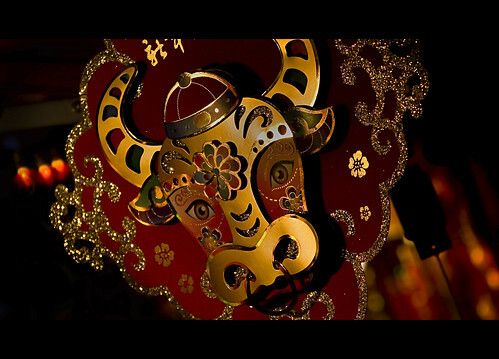 The Ox is the sign of prosperity through fortitude and hard work. Here’s to hoping all of us will be able to ride out the economic storm with fortitude and hard work. It’s going to be a tough year, as my friend Jim wrote, “2008 was the year when the financial rats got exposed, and this is the year we plow out!”. So, yeah the holiday is well underway. I learned yesterday that I may not have to return to classes until February 24th. Apparently no one told me they actually extended the last term a week and thus, pushed back the coming term! Ken? A footnote for all the Kentucky fans out there who have written to me about the Wildcats season and to ask if I have have taken a sip of coach Gillispie’s grape Kool-Aid, lets just say my tongue is purple. I am not in love with the guy (Gillispie) but he’s looking better the more I drink. Oh, and Jodie freakin’ Meeks is a beast. It’s also been a lot of fun to follow the Denver Nuggets. Speaking of beasts, I never would have thought Chauncey Billups could make such a difference, but really he is the only significant difference on that team this year. Of course it remains to be seen, but Chauncey may be “The Answer”, not Allan Iverson. OK, enough for now. I have lots of things in the hamper, so I hope to be around a bit more frequently. ~ by Expatriate Games on January 18, 2009. Beautiful pics as usual. Yeah JP is also starting a campaign against disposable chopsticks…with a lot of the chopsticks coming from China..wouldn’t you know it? Even the lunch that we order from the lunch company has suggested bringing our own chopsticks or “purchasing” our own from the company and most ramen (noodle) places have washable plastic ones now instead of the disposable ones. Glad to see you back and that you’re enjoying your vacation! More pics please! I’ve been hearing about these campaigns to ban disposable chopsticks for years. It never seems to happen. Back in 2001, Beijing university students campaigned for a ban. And Beijing introduced a local tax on the things. Didn’t make much difference. Hi Steve, thanks for dropping by and for the kind words. I mostly use a Canon 40D and a variety of Cannon lenses, including the 17 – 40mm f 4 L, the 70 – 200mm f 2.8 L IS, a 50mm f 1.4, the 100mm f 2.8 macro and the 17 – 85mm f 3.5 – 5.6 IS. I really want to get a full – frame camera and a couple of other lenses but I am monetarily challenged! OK, I am challenged in a lot of ways but as far as camera equipment goes its a money thing. Mostly.